A woman who hates shopping? Nickie I love you! Robin, I've played about an hour and am totally loving this mission. The build and layout is perfect, the vertical gameplay superb; I'm moving through it slowly to fully explore and relish every moment. Thanks for this gift. 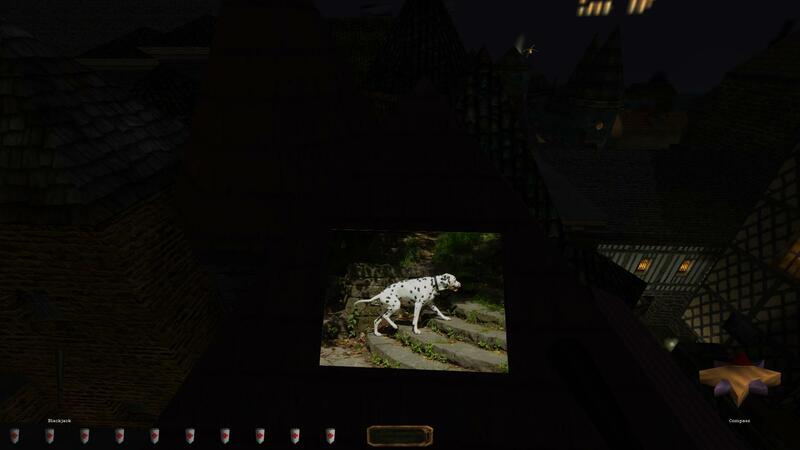 Play as if you're in "Life Of The Party"
His house is marked on the map, and the objective is to give him the sceptre or leave it where he'll find it. Put it in the chest from which you took the necklace. A woman who hates shopping? It's unfortunate that I seem to have developed a problem with my knee overnight and can't possibly walk anywhere. I want to ask whether I can enter every building on the map but I also want to find out for myself. Congrats on the release! A huge amount of work, wow. Just finished for the first time on Expert. Excellent mission, great for exploring, good atmospheric music. And a readable saying something like "we must ensure truth has its boots on", a saying I have never heard before. Altogether a real treat. It's from the phrase "A lie can travel halfway around the world before the truth can get its boots on." Who else found this little easter egg? JarlFrank, I've changed the image to a link so it isn't spoilt for other people who haven't found it and want to search for themselves. This is a nice mission, but a warning to players: it's easy to quicksave yourself into an unwinnable corner. This has happened to me twice now: the first time, I accidentally quicksaved just outside of Lord Fonsbury's locked office, leaving me no escape route that wouldn't alert one of his guards; and the second time, I quicksaved while safely hidden in the shadows in the pub where Baryn's men are hanging out—and the simple act of reloading that quicksave causes them to become alerted, thus failing the mission. So, don't just quicksave frequently: save your game manually into multiple save slots. Where do i get proof that its worth than the scepter ? i´m playing on normal mode and its the only goal left for me. The only goal left? If you don't have the proof it shouldn't be possible to complete the next goal (Find Baryn and swap the items). Are you saying you could do that? If so I'll need to look at your savegame file as soon as possible (easiest way is to make a quicksave and send me quick.sav). It's in Lady Whinford's. Find a bureau and a key nearby. I didn't find the key in it's original place during beta 7. Something is really messed up here at my end. There are two possible places for the key, both of which are close to each other. If it's not in either of those places something is wrong. Yes i was able to have a dialogue with the thieves without proof, Garrett comments this " I need a proof before entering here", although i used the thief key and the door opened, then i entered and a dialogue followed and they swapped the necklace for the scepter. Alright i´ll send you a save file. Last edited by Cardia; 2nd Nov 2015 at 04:58.
i Found the bureau, but the only thing i can frob/steal inside is a purse and a blue crystal chunk. Ah, mystery solved. That door's not locked so it didn't occur to me to see what would happen if someone used the key on it. Also, the proof gets deleted during the conv so that's why you didn't find it afterwards. The door opening doesn't make sense but at least I now know what to look for. Consider the mission complete if you've comeplete the loot goal. Yes. One down, just a thousand left to find, I guess?! There are 5 in total, but I'm not sure how many of them can be reached. They were all accessible but during beta testing I tried to make it impossible to escape. I've uploaded a new version of the FM, which fixes the door problem. See the first post for links. Savegames will not be fixed, a thing I hope is well known. Thank you Robin, i´ll assume i have this mission completed, i will replay it in expert mode once you update this mission. Where can I find the scepter?